Gt. Horkesley Table Tennis Club has a membership of around 40 players of mixed gender embracing a wide age range. We have seven teams, spread over CDTTL divisions Premier to Four, which means that we cater for "fun players", right up to the standard of "seriously good"! Early albeit limited photographic evidence suggests that GHTTC was formed in the 1940's and that the club has played table tennis continuously since then; winning the CDTTL Division One title outright in 1967 and shared in 1984 (with Paxmans). In 2013-14 GHTTC Team 'A' became inaugural champions of the CDTTL Premier League. Whilst some of our current members can possibly recall wearing turn-up trousers and a trilby; and/or a rockabilly skirt and bobby socks; few are able to remember much about table tennis prior to the 1990's. Much of GHTTC development prior to 2000 was dependent on two brothers; Eric and Len Barton. Sadly; Len passed away in 2009 and Eric in December 2013. More recently, Eric's wife June has also passed away. 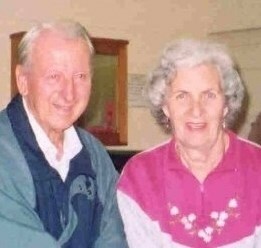 Len and his wife Maureen. 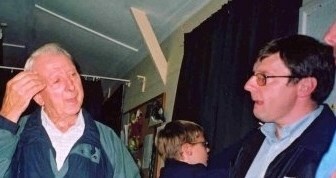 One of June's favourite memories was playing with former Great Horkesley Chairman; David Pratt; and with another GHTTC regular; Peter Nutter. It seems that opposition teams expected little challenge "with both a Pratt and a Nutter in the team"; but June was too polite to suggest how successful (or otherwise) they were in that era. It appears that in 1968 Eric took over the management of GHTTC from Derek Warner; a town stalwart; who like Len and Eric was a qualified coach. Eric played until the mid-nineties when his injured knee forced him to retire. His sons Richard and Stuart also played in Division One; so with brother Len (see later) and wives; June and Maureen; the Barton’s were a formidable table tennis family. Eric was also Hon. Secretary for Colchester Schools TTA; having taken over from another famous name; Florence Birbeck. Eric coached at several schools including Myland; West Bergholt and St Osyth despite his busy work schedule in the construction industry. A friendship between the Green's and the Barton's has flourished ever since Eric and his two sons’ built an extension to Martyn Green's old house; which was an excellent piece of work. Here; Martyn makes reference to Eric "continuing until the Council ran out of funding"; which relates to Eric's enthusiastic school's table tennis coaching and not to his business. Eric's fine professional skills were fortuitous else the Mistley Cricket Pavilion might not be standing today; whilst GHTTC might not have benefited from Eric's considerable redecorating flair after a fire in the late 1970's gutted the W.I Hall; while Martyn's home extension might be incomplete. The W.I Hall, our home for 60 years. We are seeking other monuments to Eric's handicraft as it is difficult to imagine how he ever found time to build anything. Maybe he could also lay bricks; and paint and plaster faster with a Barna Bat in his hand rather than trowel or brush? The club evidently thrived in the 1980's under the guidance of the two Barton's; including Len & Maureen taking groups of youth players to Spain and Germany. However; our guess is that the images now in the website gallery are more likely to be of wider Colchester schools groups than from GHTTC in isolation. There are probably not that many children in Great Horkesley even today! 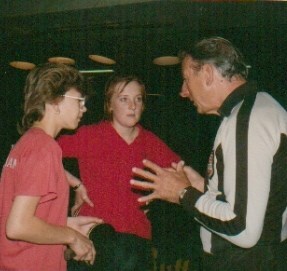 Both Eric and Len excelled as GHTTC players (and coaches). But it was away from the table where some of their greatest contributions to local table tennis were made. Whilst Eric was handling the paperwork for GHTTC and Colchester schools, Brother Len was Chairman of the CDTTL from 1977-1985; and became President in 1986, a position that Len held for twelve years. Len too was a prolific coach for over 25 years from the late 1960's; and one of his many achievements was securing enough funding to hire the then new Colchester Sports Centre for junior coaching. 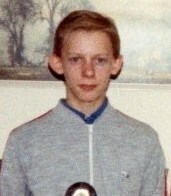 These courses led to the development of many local youngsters that achieved table tennis honours. Len first played in Colchester in 1944 and coached until 2001 when he moved with wife Maureen to Hampshire to live closer to his son, Terence. Maureen was also not shy of doing TT administration. She was GHTTC Secretary from 1981 to 2001; taking over from Eric; who remained busy at team and coaching activity until his knee finally gave way. Both Len and wife Maureen were honoured by Life Membership of the CDTTL and his memory lives on via the Len Barton Junior Merit Trophy awarded since 1992 to the CDTTL League's best youngster. 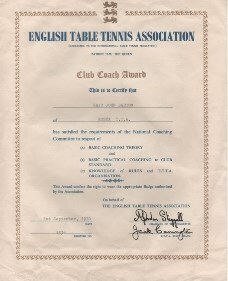 Len himself was awarded the 'Corti Woodcock Award' by the Essex County Association for his "significant contribution to table tennis". CDTTL records suggest the first GHTTC successes occur in 1975-77 when the E Team stormed to take the Division Seven and then Division Six titles (twice). We then appear devoid of much success until 1989 when the 'B' Team won the CDTTL Division Three and in 1991 the 'E' Team won Division Four; which suggests that the club was by then already of a similar membership and size to that of today. Lloyd Bennett - Smith appears to be our first ever known CDTTL Individual Trophy winner in 1991 (Division Four Singles); and the photographs taken at that time witness his youth. He remains a Premier Division player today, albeit temporarily living outside of the district. However, the glory years for GHTTC commence in 1996; after which its players have regularly featured as winners in CDTTL tournaments. Unfortunately, no GHTTC male had won the Men's Singles title prior to 2013, but Michael Wright has two recent Veterans titles (2010 and 2012) and three doubles titles. Men's singles success finally came in 2013 when Jake Collins took the title in a thrilling final. Latterly, Richard Hutchinson claimed the men's crown in 2018. Mention should also be made of our current Chairman Janet Faiers who won her first CDTTL individual trophy in 1998 yet has featured in four winning Ladies Doubles Teams since 2007. Ken Lewis also regularly won trophies between 1998 and 2002. But nobody has been more prolific than Aimee Sparkes; who has recently dominated the Ladies Singles winning in 2010 - 2013; whilst collecting four doubles titles within that same period. Although we can boast only two (original) Division One team titles; the latest in the 1980's; the club's modern day strength is reflected by having two teams in the newly formed Premier Division. Team A became the inaugural winners of the CDTTL Premier Division in 2013-14 and hold the current trophy (2017-18). 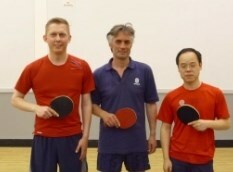 Unlike others, we don't claim to be "Colchester's Premier Table Tennis Club" (we just win it! ), but we do claim to be the friendliest. Lower down the divisions; our league winning and promotion record is prolific; probably attributable to the fact that we do have many talented players. Today, the club continues to maintain the values established by brothers; Len and Eric Barton; to whom this club remains indebted. 2014-15 saw the start of a new chapter in the life of GHTTC. 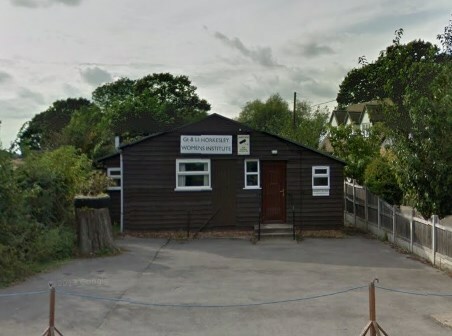 After (almost) sixty years of residence in the Women's Institute Hall we moved to super new premises at the (Old) Great Horkesley Community Hall. To find us, visit Locate Us. Don't take any notice of the historic exterior, come in and enjoy the superb level floor; the greater space, and our own excellent lighting. Enjoy!!! !